I’m proud of our client. 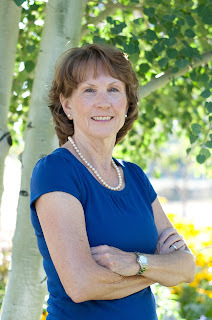 Suzanne Bragg-Gamble is the executive director of CoverColorado. When we first started talking to Suzanne about developing a communications program for GettingUSCovered, the new health plan for the uninsured that Suzanne administers, she was hesitant. She was uncertain what PR was, how it worked, or even if she needed it. Despite her skepticism, she decided to trust our judgment. Since then, she’s participated in a press conference with the Governor, conducted multiple media interviews, published a guest opinion column, done presentations at hospitals, agreed to a marketing communications campaign and hosted a webinar for over 100 insurance brokers. She even let us set up a GettingUSCovered Facebook page. You might say that Suzanne is now a PR maven. Do you have the courage to try something new? To take a leap of faith on something that makes you nervous? To overcome your fear and trust that you’ll be OK if you just dive in? Regardless of our situation at work or at home, we ought to resolve to enter this New Year determined to try something different. To do something we never attempted, or look at something from another’s perspective. To get out of our comfort zone and accept a new challenge. To throw down the gauntlet to ourselves and boldly go where we never thought we would go before. Now, that does not mean we need to be reckless or dumb about it. Let’s not make this too complicated or difficult. I’m not saying we should all start jumping out of airplanes. It could be as simple as signing up for some personal training sessions, starting guitar lessons or learning how to dance. For your business, it could be redesigning your website, updating your brand or starting a blog. Maybe you can get serious about reaching out to more diverse communities or allow your staff to handle more of the responsibilities you typically do yourself. Looking what makes you nervous in the eye is a good test for any business leader. Learning to trust your gut, your team or your PR firm will help you let go of your fear and anxiety. It will help you move forward, not look backward. I am proud of Suzanne for taking that big leap this year. We should all have such courage in the year ahead.